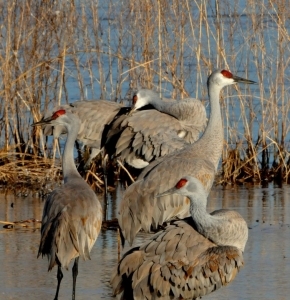 Each spring, more than 80 percent of the world’s population of sandhill cranes converges on Nebraska’s Platte River Valley. Along with them come millions of migrating ducks and geese in the neighboring Rainwater Basin—covering the vast expanse of open sky with millions of flapping wings and a chorus of calls. 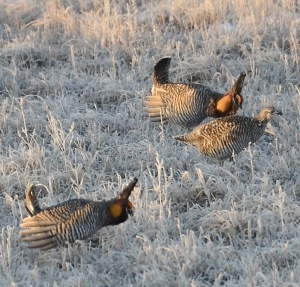 At the same time, in the grasslands of Nebraska, male sharp-tailed grouse and greater prairie chickens are vying for the attention of hens. Their raucous lek displays include clucks, whoops, gobbles, exposed tail coverts and balloon-like air sacs flashing orange and yellow. Get ready for spring magic in Nebraska! Day 1 (Fri, March 29) – Denver to Burwell ~ Morning departure from Denver for drive Switzer Ranch Prairie Reserve located near the town of Burwell, Nebraska with birding en route. The American Bird Conservancy has described Nebraska’s Sandhills as “the best grassland bird place in the US”. Switzer Ranch is a traditional ranch in the beautiful Sandhills of Nebraska that employs modern, cutting edge stewardship practices to conserve native prairie and the wildlife it supports. Switzer is one of the first ranches in the area to explore ecotourism. Day 2 (Sat, March 30) – Switzer Ranch Prairie Reserve to Alda ~ Today begins early with a visit to a greater prairie chicken lek on the ranch. Trip participants will be treated with outstanding dancing displays by males as they try to move up in the social hierarchy and gain the attention of hens. There’s time this morning for birding at the ranch and nearby Calamus Reservoir before the drive to Alda, Nebraska. At 4 pm, check in for your VIP Experience with the Crane Trust. The VIP Experience includes two private blind sessions in a the heated Pietrok blind, at the site of the Platte River’s largest sandhill crane roost. 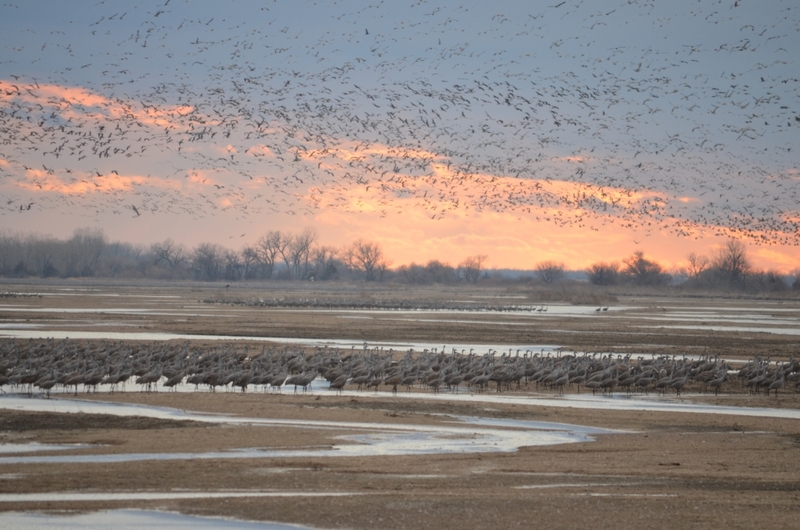 Watch as thousands of cranes return to their roost along the Platte River this evening. Today ends with the opportunity to visit with Crane Trust staff and conservation experts. Day 3 (Sun, March 31) – Alda to Denver ~ Wake up early this morning for another private blind session at Crane Trust. After breakfast, start heading back to Denver with birding along the way. Price: $975* per person based on double occupancy. Single accommodations are subject to availability. Contact us for details and pricing. Inclusions: accommodations, all meals starting with lunch on Day 1 through lunch on Day 3, transportation in a 12-passenger van (Ford Transit or similar), full-time driver/guide, local staff at Crane Trust and Switzer Ranch, entrance fees, and a donation to support local conservation efforts in Nebraska. Exclusions: travel insurance, gratuities, and items of a personal nature. Plan to depart north Denver by 7:30 am on March 29 and return around 7 pm on March 31. *A 3% discount will be applied to payments by check.